Hell in a cell is one of the most feared matches in WWE history, and with good reasons. WWE Superstars have had their bodies destroyed in the match. As the 21st anniversary of the Hell in a Cell match approaches, here are 5 unlucky superstars who have fallen from the steel cage. Shawn Michaels was the first superstar to survive Hell in a Cell, but was also the first victim. 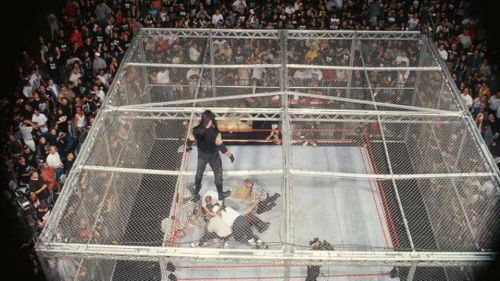 As Michaels climbed down the cell at Badd Blood in 1997, The Undertaker stepped on his fingers, forcing the Heart Break Kid to lose his grip and fall, going through a table back first. 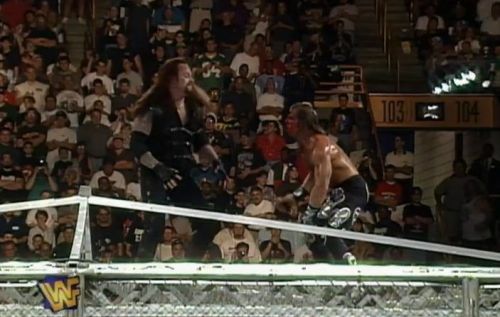 The Undertaker then tosses Michaels onto the broken table with his face covered in blood. Shawn Michaels in the end pinned The Deadman who was Tomb-stoned by Kane. The length of the match was exactly 30 minutes. Mick Foley fell from the cell 4 times in his career. The Undertaker was responsible for 3 of them. He infamously sent Foley off the cell twice at King of the Ring in 1998. 2 months later, The Deadman threw Foley off the side of the cell on Raw. To Foley's credit, the match still continued for 10 more minutes as he remarkably recovered after that fall, but in the end Undertaker picked up the victory. Mick Foley was also punished by Triple H at No Way Out in 2000. The Game sent Foley flying through the roof with a back body drop. This match was put in place to end the feud between Cactus Jack and Triple H, so that Cactus Jack could retire and Triple H would go on to WrestleMania.